If you have swollen feet but still want to keep active, take a look at Move from Cosyfeet. These sporty-looking, wide shoes for women are incredibly shock-absorbing so your knee and ankle joints are protected when you’re on the go.. If you have swollen feet but still want to keep active, take a look at Move from Cosyfeet. These sporty-looking, wide shoes for women are incredibly shock-absorbing so your knee and ankle joints are protected when you’re on the go. 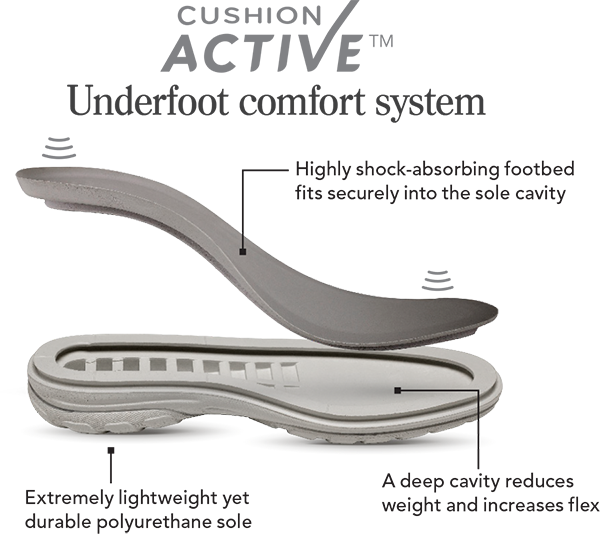 The spongy, cushioning footbed gives an exceptional level of underfoot comfort while the lightweight, super-flexible sole moves with your foot for maximum comfort. They also have an ‘Airtex’ lining which draws moisture away from your feet to keep them fresh and dry. For extra comfort, they have a padded tongue which gently cushions your instep and a soft, padded collar that fits both swollen and slimmer ankles. In tests by the University of Central Lancashire, Move was shown to deliver between 23% and 25% less impact shock to the lower leg than other leading brand trainers. This is due to the ‘Cushion Active Underfoot Comfort System’ which offers an exceptional level of shock-absorption and cushioning.